I have been a single mother raising twin daughters pretty much all their life but recently (2 years ago) remarried a fairly successful man who has from day one said he will not contribute to their education. He provides absolutely NO support for the girls, I pay their tuition and everything else they need all on my own. My daughters are seniors this year and getting ready for college. I have saved $14,000 for their education on a secretary's salary of $30,000 per year. We will need a considerable amount of financial aid. If I file the FAFSA, I know that we have to report my husband's salary which will totally sabotage their chances of receiving aid. My ex-husband and I have joint custody of the girls and he has sent child support payments regularly over the years. He recently became unemployed and lives with his mother, therefore the payments have decreased considerably. I know that the girls will be eligible for more aid if he files the FAFSA. Can we do this? Do you have any suggestions on how we could get the most aid? If my ex-husband files the FAFSA, should he claim them on his taxes this year? Do the girls need to change their address to his? — C.G. When a dependent student's parents are divorced, only one parent is responsible for completing the Free Application for Federal Student Aid (FAFSA). Section 475(f)(1) of the Higher Education Act of 1965 specifies that this parent is the one with whom the student lived the most during the 12 months ending on the application date. Otherwise this parent is the one who provided the most support to the student during the 12 months ending on the FAFSA application date or the most recent calendar year during which either parent provided more support. Sometimes the family can manipulate which parent is responsible for completing the FAFSA by changing the number of days the children live with each parent. This might be possible if the parents have joint custody, but not if one parent has sole custody. College financial aid administrators will question the living arrangements if they are not consistent with the student's secondary school enrollment (e.g., the children attend a secondary school in a different school district). Recent changes to a custody agreement may also raise suspicions. The financial aid administrator has the authority to ask for a copy of the divorce decree or separation agreement to verify the custody arrangements. The college cannot disburse federal student aid funds if the parents refuse to provide this documentation or if there is conflicting information. Whether one parent or the other claims the children on his/her income taxes is irrelevant to the determination of which parent is responsible for completing the FAFSA. The IRS and the US Department of Education use different rules, as specified in the Internal Revenue Code of 1986 and the Higher Education Act of 1965. If the custodial parent has remarried, the stepparent's income and assets must be reported on the FAFSA, as required by section 475(f)(3) of the Higher Education Act of 1965. There are no exceptions to this rule, not even if there is a prenuptial agreement. A prenuptial agreement is between the husband and wife, and does not overrule statutory requirements, such as the federal need analysis methodology. The federal government does not have a greater responsibility for paying for a child's college education than the stepparent. Accordingly, when a custodial parent remarries into wealth, this often reduces eligibility for need-based financial aid for college. 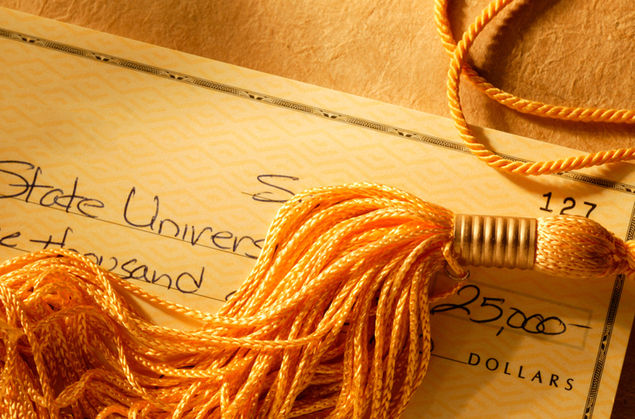 If the stepparent refuses to contribute to the children's college costs, it can sometimes prevent the children from pursuing a college education. Sometimes it helps to show the stepparent how much need-based aid the stepchildren are losing because of the marriage. The stepparent may be refusing to contribute in part because of concerns about the potentially unlimited cost of college. The stepparent might change his or her mind about helping with college costs if presented with a much more reasonable figure based on the impact of the remarriage on the student's eligibility for need-based financial aid. It also helps if the costs are based on a reasonable selection of low-cost colleges, as opposed to a college that costs $40,000 or more a year. The reduction in need-based grants can be calculated using the new net price calculators that colleges and universities must now provide on their web sites. Just calculate the net price with and without the stepparent and the stepparent's income in the household. The difference in the two net price figures shows how much grant money the stepchildren are losing because of the marriage. Do similar calculations for a variety of colleges, including an in-state public college. This approach isn't perfect, since some net price calculators are more accurate than others, but the results should be in the right ballpark, plus or minus a few thousand dollars. Note that having two children in college at the same time generally yields more financial aid per child than having just one child in college at a time. So having twins is better than having singletons who don't overlap. Also, some colleges offer discounts or special scholarships for twins or other multiples.